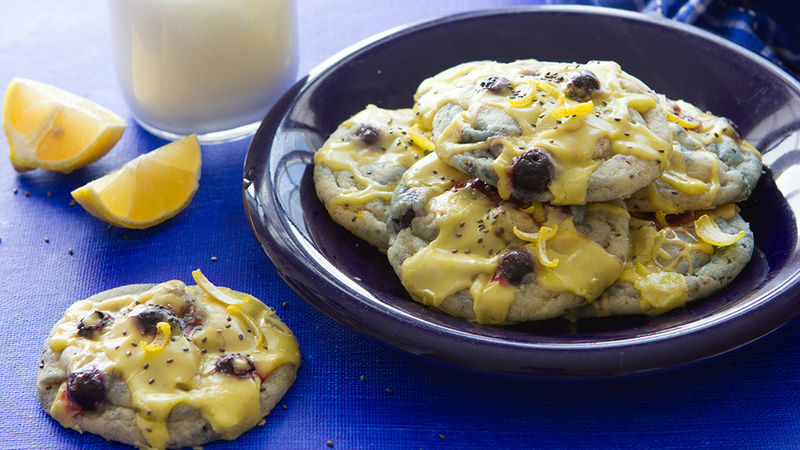 In a large bowl, knead together cookie dough, flour, 3 tablespoons of chia seeds, and lemon zest until well combined. Gently fold frozen blueberries into the dough. Do not overmix. Drop dough by rounded teaspoons onto baking sheets covered with parchment. Bake in preheated oven for 9-12 minutes, or just until the cookies begin to set and the bottom of the cookies are a very light golden color. Remove and cool completely. In a small bowl, mix together lemon juice, powdered sugar, and food coloring. Add just enough water (if needed) to make the glaze slightly thicker than syrup. Drizzle icing over cookies. Sprinkle with chia seeds and garnish with slices of lemon rind, if desired.